Cathedral Cross of the Lamb Complementing Altar Candles 2" - 12"
Every Eximious candle from Cathedral is individually hand-made with intricate inlays, rich onlays, and classic sculptured engravings. 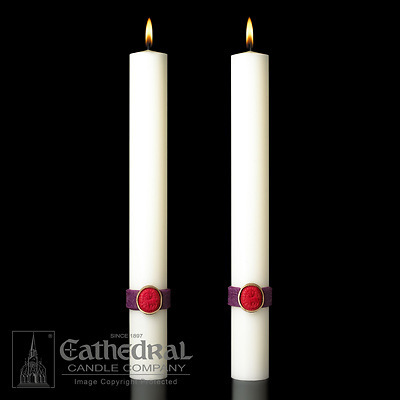 The Cross of the Lamb Complementing altar candles feature engraved red and purple bands designed to match the Cathedral Cross of the Lamb Paschal Candle. Sold as a pair. Available in lengths 12" and 17" and diameters from 1-1/2" to 3". Sold as a pair. Made in the USA of 51% beeswax. For assistance in determining the right diameter use the Size Chart button.